Official Disneyland App Is A Must For Your Summer Visit - Ski. Play. Live. If you’re like me- a Disney geek who’s constantly playing with her smartphone- you’ll appreciate the effort Disneyland is making to keep us all connected. There are a zillion third-party Disneyland apps but now there’s something from the horse’s mouth. Find the fun faster with maps of attractions, restaurants and shops. Check attraction wait times, most Character appearance schedules and entertainment show times. 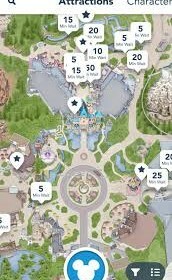 My fave is that you can find the closest bathroom and drinking fountain with the Disneyland app. The wait times seem to be quite accurate so if you’d rather not aimlessly wander throughout the park you’ll be checking the app frequently for effective time management. You can even purchase park tickets instantly from your phone or mobile device. Simply show the barcode at the gate for admission when you first arrive — no ticket booth lines to stand in or e-tickets to print out. 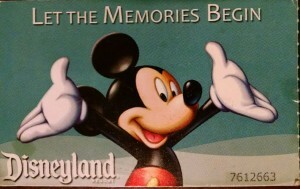 but then you won’t have a cute Mickey ticket for a souvenir. The app isn’t without a few drawbacks. Maybe imagineers planned to put the FastPass on the backburner but users grumble about the lack of details in that department. As much as I’d like the convenience of being able to get a FP directly from the app, all of the passes would be gone in seconds if that was an option. There’s something to be said for legwork. If you click a particular ride in the app it will say whether it offers a FP option but you have to hunt for the actual FP tab. It’s under the Guest Services tab and then the ‘list’ button on the right. That’s a lot of clicking. A dedicated FP tab could also give current return times, which machines are in service and for what attractions. That would be sweet. When I was at Disney Paris more than half of the FastPass machines were shuttered and you wouldn’t know until you jogged over to them. The CMs would tell you they’re out of order and check back. You would go back two or three times to see and they would still be down. Total waste of valuable ride time. The Disney app is also missing dining wait times and the ability to make and modify reservations. When you click for reservations it takes you to the Disney website but that is obviously something that can be handled within the app. But really the BIGGEST PROBLEM OF ALL doesn’t have to do with the app itself. Cell reception is spotty in most areas of the park. Management needs to boost the towers so the app is more effective or at least make it so that the app can be used offline. It works that way for the Disney Cruise app, why not for the Parks app? All in all, however, if you’re planning a trip to Disneyland this summer it’s something you’ll want on the tips of your fingers every minute of your trip. Download the official Disneyland App at disneyland.com/magic or from the App Store and on Google Play.